The LB's teacher, K, is terrific at what she does. I am in awe of her on a regular basis, even (maybe especially) having been a teacher myself. She is a very artsy, sophisticated woman. She has degrees in art as well as education and she pursues several different artistic hobbies, including painting and jewelry-making. She also has a real talent with felted wool; she makes beads for stringing into necklaces and interesting appliques for her daughter's clothing. I have noticed that she likes to wear scarves fairly often and thought a crocheted scarf would be a nice gift for her. I used a pattern I found on Ravelry. The pattern, One-Skein Chevron Scarf, is available as a free download. 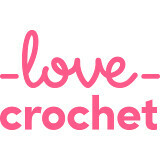 It's really simple and requires minimal crocheting skills. It was peaceful and soothing to make; the pattern is repetitive and easy to memorize and I found myself working in an almost trance-like state once I got going. I worked on it a lot during our audiobook times in the afternoons and some in the evenings as well. I chose a soft silvery-gray yarn for the scarf; K often wears black and gray. It seems to be her signature look. I debated making the scarf in a rich jewel-tone, maybe a plum or garnet shade, but I decided to go with the gray because it just seemed to be "her." The yarn is Yarn Bee Soft Secret, from Hobby Lobby. The shade I used is called Fog. It's 100% acrylic but it's one of the nicest acrylics I've used; very soft and silky and doesn't look like it will pill much, if at all. I like it a lot and I think K will like it too. The GB's teachers were a little more difficult to choose gifts for. I feel that I don't know them as well as I know K since the GB is in school only a few hours a week. But I wanted to do something special for them too, and to me, that means something handmade. I decided to make them some little bird decorations. I deliberated on how to make them; I frequently make, or buy, little bird ornaments to use around our house because I think birds are pretty and sweet as decorative objects. I have a string of silk birds with bells hanging on the rarely-used side of our double front doors. My daughter's bedroom has a distinct bird-and-owl theme. I make little stuffed fabric birds to hang on dresser and sideboard knobs. I'm a little bit bird-crazy, actually. The GB's teachers are going to receive little felt bird ornaments which I have hand-sewn. I think they came out well. I gave them button eyes, little appliqued fabric wings and ribbons for hanging. They were very easy to make and I can give you more specific details if you want them, just let me know. I tried to make them sort of shabby-chic/vintage-looking. I always think that felt decorations have an old vibe to them, sort of 1940's. Maybe it's just me. Anyway, they were fun to make. I did them both in one evening, while I was vegetating in front of cooking and travel shows on Create TV. The purple one has a wonky beak; I think I thought it would look prettier if it came up at an angle against the face. I wasn't crazy about it so I made the blue one's beak more of a perfect triangle, like a child's rendition of a bird's beak. Well, these are very whimsical birds, nothing here is meant to be anatomically correct. I plan to put the birds in a small gift bag with some chocolate for each of her teachers. Now, as my post's title suggests, there was also a gift for me this week. ME ME ME. Greedy old mommy. For Christmas, the Bear had given me a gift certificate to a very nice local yarn shop called Village Wools. I was meant to spend this gift certificate however I liked but I really wasn't sure what I wanted. I made a trip to this shop in January or February to have a look around but I didn't buy anything. I find it difficult to spend money on myself, even when it's a gift. I'm really not trying to sound humble or selfless, either - it's just very hard for me to make myself do it. It wasn't even a ton of money; he gave me an amount which was generous but not exactly carte blanche to go nuts there. In the end, I did manage to force myself to spend it, going back there this week. I even added a little bit on top of the certificate amount. I sure licked that can't-spend-on-myself problem, and how! Ha. I had left the yarn shop after that first time with a few brands and yarns in mind and did some perusal online to make sure the prices at the LYS weren't too outrageous (they were not) or that I couldn't find better selection elsewhere. I settled on Debbie Bliss Baby Cashmerino, because so many of my favorite crafty-blog mavens love to use it and because it just seemed so gorgeous in the store. The displays in the LYS are not terribly neat but they do have an excellent selection. I decided to buy myself a selection of balls from the whole spectrum, as opposed to a color family. I had considered buying myself just greens, blues and purples, as in the above photo, because those are my favorite colors. But this yarn will be used specifically for smaller objects, since it's expensive, so I won't need a lot of it and it seemed like a good idea to have a whole range of colors in that case. My blankets will probably be mostly Stylecraft Special DK acrylic from now on. The Baby Cashmerino is destined for items like Cherry Heart's Stripy Mitts (I have a jar full of buttons just begging to become part of this design), possibly a shawl, maybe a hat/scarf set for myself. Operative word here being MYSELF; I'm the only one around here who would truly appreciate anything made with luxury yarns. Is that mean? Maybe. But it's also true. So I ended up with eleven balls. My gift certificate covered the cost of eight balls and I paid extra for three more. The Bear was completely ambivalent when I told him so I guess I made the right choice. I am so excited to have this yarn in my possession. Other than the Debbie Bliss Rialto Aran sent to me by my Ravelry swap partner, this is the nicest yarn I have ever owned. I can't wait to make something with it! Gratuitous yarn shots! Wheeee! You know what's fun to photograph? YARN. So I did it a lot. I love the colors I ended up with. I wanted to try to get a good sampler but I also wanted a pretty tight progression between the colors, nothing too "off" next to the others. The only one I had reservations about is the mustard shade; the LYS had only two yellow options, the mustard and a paler baby-yellow. I didn't think the baby yellow seemed as useful; it was too weak next to my other shades, like the dark eggplant and the red. I think the mustard pulls them all together better. It's just that mustard isn't really my kind of color...it's okay but I feel kind of "ehh" about it. But it works. They're all beautiful. I'm very happy with my Christmas gift in May. I just want to say thank you, from the bottom of my heart, for your comments on yesterday's post about my experiences with preeclampsia. It means a lot to me. Really. Hello and welcome to my new readers and followers. I'm so glad you're here. Please make yourself at home and let me know if you have a blog so that I can check it out. Ohhh, Village Wools. How I miss visiting it and petting all the yarn! Sadly, now that my boyfriend has moved to a different city, I have no opportunity (or excuse!) to visit Albuquerque and that lovely LYS anymore. I absolutely love the scarf you made as a teacher gift. It is really really beautiful and I'm sure it will be very well received. Love your yummy new yarn too. Love the Chevron Scarf it has fashion, mystery ,and flare ... well how could you not with the yarn being a shade called FOG ... love it ! You're such a wonderful giving person. I am sure the scarf and little birdies will be appreciated!! The gifts are sweet and beautiful. I'm happy that you allowed yourself a little something too :) Enjoy your weekend. Hi Jennifer! Thanks so much for visiting over at my blog. What lovely things to say. I'm a bit like that when I find a product I really love. We used to have really nice coconut icy poles over here in Australia too but can't find them. I can remember a really, really lovely musk icy pole when I was growing up. I could kill for one of them now. I'm your latest follower too. I hope to get to know you better through your blog. If you're interested, I have a linky party every Thursday featuring frugal type hints, recipes and crafts. I bet a lot of my readers would love to see the lovely things you create. Nice to meet you Jennifer. Hello Jennifer, love your blog. The previous post about your personal experiences was so powerful and this one makes me wish I was one of your young bears' teachers, you are so creative and generous. I'm fairly new to blogging, still learning how to illustrate, inspired by your yarn photos and how lucky to get the Debbie Bliss yarn. Looking forward to see what you make with it. I would love to try it myself. What lovely presents- I would feel very honoured to have one as a gift. You're a talented lady! I love the scarf and it looks easy enough for me. I'm saving this one to do later. the scarf is beautiful. And that wool.. sigh.. gorgeous. I really must start some winter knits before winter is over!! Oh, and I love the birdies, too. I have made similar, but yours are beautifully finished with the wings. I'm afraid I'm a bit of a corner cutter. This will inspire me to slow down. Great job! You are very creative Jennifer! Have a wonderful weekend. Oh I love all of this!! You always make amazing stuff. 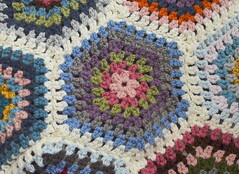 And the yarn is great, I can never stay out of Joanna Fabrics :) I love all the colors, simple yet so colorful!! My mom always made me give gifts to my teachers. I feel its a good lesson to learn for kiddos and is very important. Giving is so much better than receiving. I hope to teach my kids this lesson also someday. Handmade things are always so much more special!! I wanted to respond to your comment on my post but couldnt because you dont have your email linked. So many good things here! My first ever crochet project was made with Debbie Bliss baby cashmerino and I think it's worth every penny. Or cent, depending on which side of the pond you live! 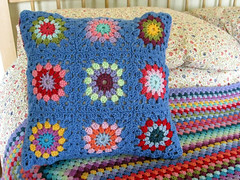 After practicing my granny squares on squeaky acrylic yarn, it was a dream to work with something so soft and luxurious. I hope you enjoy using it. Those stripey mitts sound like a great project. The pictures of the yarn are gorgeous. I love all the colors. I'm dying over the little birdees! They look so fun! Love your teacher scarf! Makes me realize I've got to get cracking on the teacher gifting projects as well. Your little birds made me smile and the gratuitous yarn shots? Divine!